Do a search for news in your niche. Find out who the breaking news leaders are for your area and start bookmarking them and checking them daily. Identify the trends in your niche through the news and any other sources (associations and the like) that are pertinent. Provide examples of the trend for your reader to draw on. If the trend is for something the reader can take advantage of, like travel or food, give resources as to how the reader can participate. A list of appropriate web sites, books or other sources is a great way to do this concisely. Analyze the trend for your reader. One of the best ways to develop your readership and solidify your reputation as an expert is to expertly analyze the information you have found. Give your readers not just the information, but help them use it. Don’t just write about why the fuel-cell-powered car is great – tell them how many kids they can get into it, how long a ride they will get out of it and whether or not you think it’s a good deal for the money. Your conclusion should include a quick summary of the trend and a clue as to where you think this trend is going. That’s not the end of it. Keep up on the trend you just wrote about. Write follow-up articles. 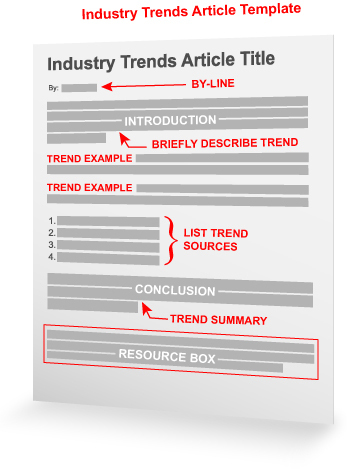 By using this template, you should be able to write at least one traffic-generating article per week on trends in your niche. You’ll be surprised how easy it is to find and create these articles once you get the hang of identifying and analyzing trends. Now put it to good use by making a trend article part of the next set you submit. Then leave us a comment to let us know how it worked out for you! Thank you for sharing another article template that we can use to write the next set of articles. Love reading your blog as it always gives me ideas to write more fresh and unique articles. I like using Google Insights for this, instead of popular Google Trends, I use Insights – relatively a new service, still in beta. Thanks so much for these templates. I’m just getting started in article writing and am a bit overwhelmed. The ideas here have given me the structure I needed.